Plan vacation or business trip with eTravel.com and take advantage of cheap rates on flights booking, airline tickets, and lowest airfares for Mumbai. 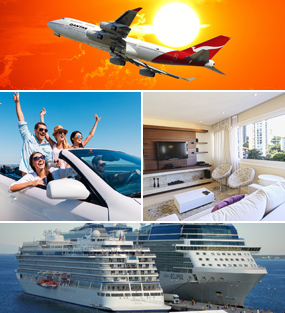 Search cheap flights to Mumbai, find and book single or multi-city destination flights. On this page we give you information and glimpse of visiting places in Mumbai, Maharashtra, India. Mumbai is the financial capital of India. The island city is made up of seven islands and lies on the west coast of India and is the capital of Maharashtra state. This metropolitan city is most populous and the wealthiest city in the country boasting of celebrities, restaurants, bars, and most happening clubs. Anyone traveling to India must have Mumbai on their bucket list. What is The Best Time to Visit Mumbai? Being a coastal area, Mumbai has tropical climate with seven months dry and the rest is monsoon, July-August at the peak. Though people from all over the world throng the city all year round, December to February is quite pleasant and the most touristy time of the year. One can enjoy the breeze and roam around the city comfortably. March to May and October to November are usually quite humid, making it difficult to step out. Mid June to early September is the rainy season, however, it is also a beautiful time of the year. What are the must see attractions in Mumbai? Mumbai has a lot to see, from British old world charm in rustic buildings to the present day bar culture, there is something for everyone. Topping the list of famous attractions is Gateway of India, the most distinguished landmark in the city, which sees thousands of tourists every day. The structure was made in British era in the year 1924 to welcome the arrival of King George V and Queen Mary to Bombay. It is also the port for embarking on ferry rides and yacht cruises. The famous Taj Hotel is right opposite. Juhu Beach, one of the largest beaches in India is home to top movie stars and elite celebrities. The beach located in the suburbs is a prominent spot for locals and tourists alike. One can find diverse activities here - people jogging, doing yoga, playing football, to college students and travelers gorging on to delectable street food. The place gets particularly crowded on weekends, wherein there are various activities for adults and kids alike. Famously known as Queen’s Necklace, this 4 km long stretch of promenade sits on the south of Mumbai overlooking the Arabian Sea. Marine Drive is one of the most beautiful roads of Mumbai with a bird’s eye view of its curve looking like a queen’s necklace, hence the name. Besides, Mumbai boasts of amusement parks, temples, a national park, and a plethora of malls having luxury as well as high street brands, fine dining restaurants, pubs and bars, offering so much that no amount of days would ever be sufficient to explore it all. How to Save When on a Mumbai Tour? It is advisable to make the flight and hotel bookings at least a month in advance. Many international airlines offer great discounts on flights, make use of them. Move around the city in public transport such as local train or bus to save money on commuting. Try delectable street food instead of posh hotels to save on meals.